I keep checking for the interface update release that Roku announced a while back but I keep getting disappointed. Now finally Roku has announced on their blog of the release being launched. With Google I/O 2013 going on I feel this update has been missed in some tech blogs. 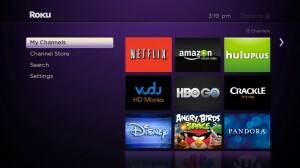 For Roku users this will be a large update for how the Roku interface is utilized. Now Roku users may arrange channels in the order they want in a tiles formation. In addition Roku users will gain the use of a search tool and home screens theme. This update is only for users of newer Roku devices such as: Roku 2 XS (model 3100), Roku 2 XD (model 3050), Roku 2 HD (model 3000), Roku LT (models 2400 & 2450), Roku HD (model 2500) and the Roku Streaming Stick (models 3400 & 3420). I had a user question why their two year old smart phone could update to use some of the new content coming out bbut not their two year old first generation Roku. The answer is simply that Roku releases a product at a very low price. To meet this price the CPU and memory are not comparable to a current generation Android device. There are some Android stick devices coming out now that compete well with the Roku. You may look at them to see if the content you want is well supported. For my household we are sticking with the Roku for the simple user interface. Another big update for the Roku is the addition of Official PBS Channels. PBS and PBS Kids give access to full length shows and clips. I’m happy for this addition and I hope my nearly two year old son will enjoy seeing more of his PBS favorites on the Roku. We currently watch some PBS shows on the Roku via Netflix but having a few more would be great.